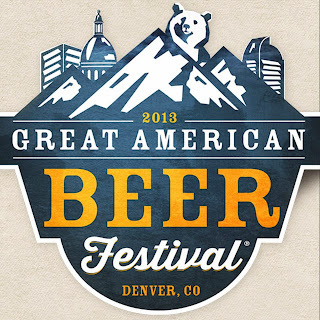 Well, Great American Beer Fest tickets sold out again in record time, and once again beer fans are frustrated to the point of anger. Once again, I used my standing as an AHA member to take part in the members-only presale and was able to get all the tickets I wanted. Everyone that I know in the office who tried also got everything they wanted (including two co-workers who purchased an AHA membership JUST to get GABF tickets). Lots of members got stuck with the Saturday evening session, though. Personally, if my choice is to go to the Saturday evening session or to not go, I would pick to stay away. For me personally, things went much smoother than last year (see #GABF #TicketMasterFail), but the TicketMaster process was far from flawless. I got my Friday night tickets no problem, but when I went to try to get the Saturday afternoon tickets, TicketMaster was not recognizing my Membership Number. My family and I went on vacation last week to South Dakota. Before I left, knowing that when traveling I like to try different local beers, I tweeted my virtual friend @BryanDRoth asking if he had any South Dakota bloggers in mind for his "Six-Pack Project". I was hoping he had someone I could ask for suggestions on South Dakota local craft beer to try. He answered that he didn't. He did suggest that I could provide research for South Dakota Beers. Not really what I was after, but I figured I would at least be able to share my beer experiences there. While in South Dakota, we did all kinds of cool things. I was in the liquor store last week looking through the beer section when I found a four pack of Ommegang's Hennepin Farmhouse Saison. Knowing that it was tied for 46 on Zymurgy's 2013 Best Beers in America list, I grabbed it. I tried the beer over the weekend. Ommegang's Website says that Hennepin Farmhouse Saison is an "ale brewed with grains of paradise, coriander, ginger, sweet orange peel." It is 7.7% ABV and 24 IBU. My sample was a hazy pale gold with a fluffy white head and lots of carbonation. The aroma was lots of Belgium farmhouse funk blended with the various spices. I got significant orange (probably from the coriander and orange peel). It tasted pretty much the same, although I think the orange was a little more lemony. It starts out sweet with spiciness in the middle and does finish off pretty dry (as a saison should). I have not done a "what should I brew" poll in awhile. The last one I did (see What should I #HomeBrew Next?) got lots of responses, although almost half of them came in after the decision was actually made. The decision I am currently having trouble with is what Category 18 style should I brew? If you are a regular reader, you probably know that I am home-brewing through the BJCP Categories. My goal is to have brewed at least one beer in all 23 beer categories of the BJCP Style Guidelines. As I type this post, I have 6 categories left. What category 18 Style should I brew? It is that time again! It is time to post quarterly updates on how much the SheppyBrew Brewery has brewed. I've been doing this for quite some time because it is fun for me to go back and look at how the brewery has been doing. Plus, believe it or not, readers have mentioned they enjoy looking at the brewing stats. You can see all of these reports (including the one you are reading right now) by following this link: http://blog.ericshepard.com/search/label/Brew%20Stats . Earning untappd badges has gotten pretty rare for me. The last time I had enough to report on was mid-May (see Still More @Untappd Badges 9) and before that was mid-February (see Still More @Untappd Badges 8). Back in "the day", I was getting enough pretty much every month to do a new post. As you probably know, I've started trying to find beers that I have never had from the Zymurgy's 2013 Best Beers in America list. At the same time I picked up Firestone Walker Wookey Jack, I also got a 4 pack of Boulevard Brewing Company's Tank 7 Farmhouse Ale, tied at number 32 on the Zymurgy list. This past weekend, I gave it a try. With all the IPAs on this list, a saison was a welcome change. Boulevard Brewing Company is located in Kansas City, MO. Its website says it is Missouri's 2nd largest brewery. According to the Brewer's Association, it is the country's 12th largest craft brewery. Boulevard distributes to Colorado. It seems odd that I've never had any of their beers. 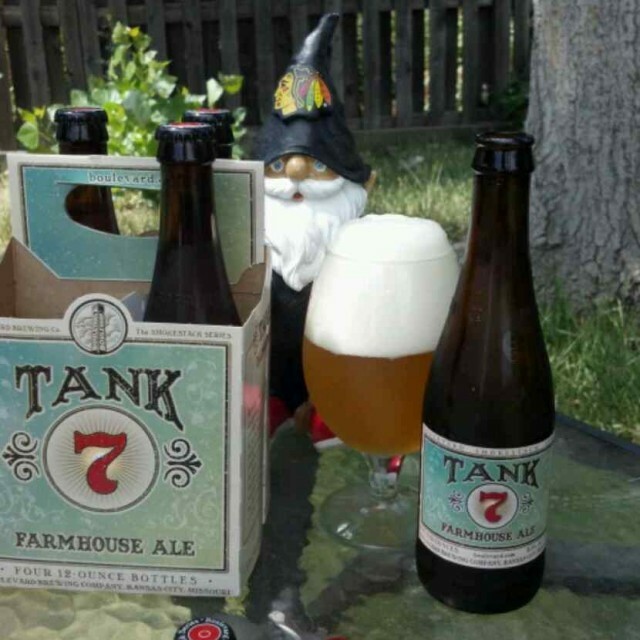 I'm glad the Zymurgy list got me to try Tank 7. 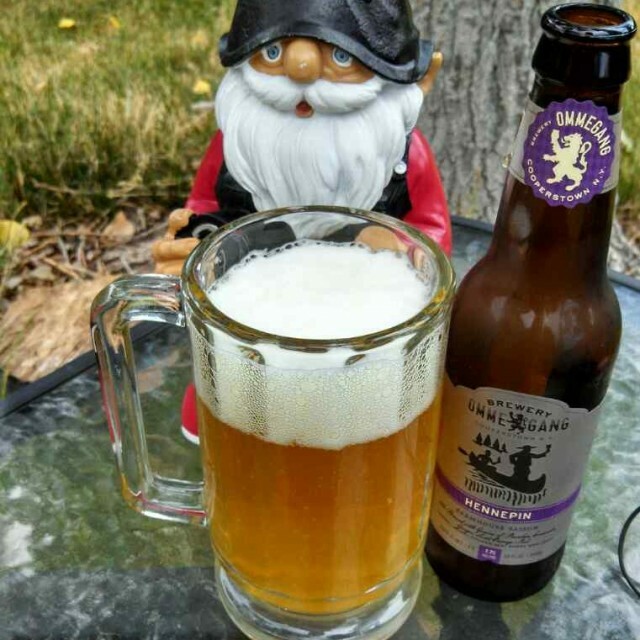 As I've shared with you, I am terrified of Gnomes, but Gnasty is helping me get over my fear. We enjoy the same sorts of beers and of course we both love watching the Chicago Blackhawks. We even brew together. I still don't quite trust him. I am sure that his ultimate plan is to attack me in my sleep, but we have become friends. As I mentioned back in January, Gnasty and I were going to design a home-brew recipe together. You might have noticed that some time ago we did that and already posted the recipe "Gnasty the Gnome ESB" on the SheppyBrew website. If you didn't notice, you probably need to start following SheppyBrew Brewery on Facebook. Go ahead and "like" us. It is completely worth it. Gnasty the Gnome ESB is a Category 8 English Pale Ale, subscategory C Extra Special Bitter. It is, in fact, the Category 8 representative of my initiative to make sure I've brewed everyone BJCP style category (see SheppyBrew Styles).